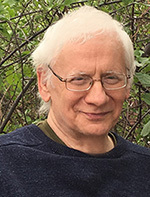 Graham Diamond began writing as a fantasy and science fiction author. He was born in Manchester, England. His family moved to the United States when he was a young child, and he was raised in New York City. He graduated from the High School of Music and Art, then attended CCNY as a Fine Arts major and the Art Students League of New York. Diamond turned to professional writing in his late twenties and is best known for books such as The Haven, Lady of the Haven, The Thief of Kalimar , Black Midnight, and Forest Wars, Marrakesh, Samarkand, Samarkand Dawn. He soon turned to other genres; including historical fiction, thrillers, and later the true story of a Holocaust survivor's family during World War II, Maybe You Will Survive (Holocaust Press, 1991). Several of his books were published in the UK by Methuen, and In Italy by Mondadori. Under the pen name Rochelle Leslie (the names of his daughters), he authored Tears of Passion, Tears of Shame, a fascinating novel of South Africa set during the Zulu War of 1879, subsequently published in Italy, retitled, Venuto De Lontano, (To Come From Far Away) . He also has had various short stories published in anthologies. In addition to his writing, he was employed as an editorial artist and production manager by the New York Times for many years, and taught creative writing in both New York and California. He regularly volunteers and lectures across the United States. "So much of my youth was spent studying in libraries," he says, "they became almost a second home."